Well, here you go – the system that started it all for a lot of people. I never owned one of these when it was new but this was the first system I bought when I started getting nostalgic in the 90’s. Paid $15 for it with 13 or so games in the early days of Ebay – you’ll never find a deal like that on a system in this condition today. Well, not on Ebay, anyway. This is a common four-switch model, made in Taiwan in 1980, but it does have all of its original accessories, including the box (serial #’s match), and everything works perfectly. It’s minty fresh, though the box has seen better days. Couple interesting things to me about this box – for one, it shows a four-switch console in the original “heavy sixer” casing, which never existed. Atari had switched to the lighter casings even before removing the two extra switches from the front face. Nothing special about my box, though; I believe they were all like this, at least up to a certain point in time. 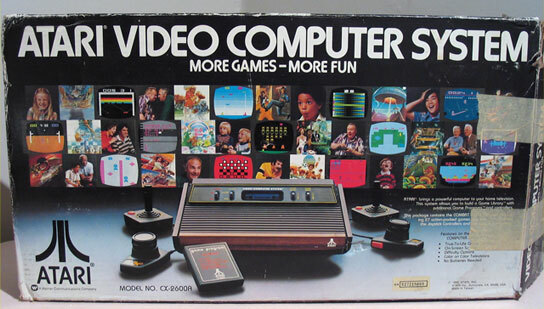 Of course, what makes the whole box design work is the images of all these people having their minds literally blown out of their skulls playing stuff like backgammon and checkers. Would this image make you want to buy a game console? Is she supposed to be having fun or is she just in need of some fiber? I love the 2600, But I have to admit, after playing Atari 2600 games so much, they have gotten boring. And while I have one, it’s just been sitting in it’s own special storage box for a long time. ah the king.or maybe grandpa or the pioneer,however you think of it,we must give it full respect. 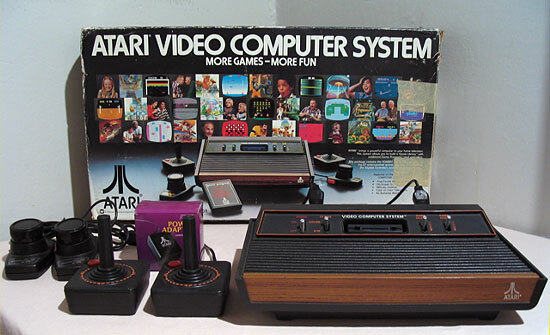 the 2600 vcs is the founding father to all the consoles we have today,the one who invented home gamers,and killed the video arcades,back in 1982 long ago i started with the 2 pennicle sysyems , intellinision and 2600 the dynamic duo,and still love and respect and play them today,such as yars,frogger,mario bros,berzerk,pitfall,megamania,and many many others……hail to the chief HAVE YOU PLAYED ATARI TODAY?